Try, try again. That motto certainly applies to Yakima’s efforts to be named an All-America City. During a ceremony June 14th at the Sheraton hotel in downtown Denver, Colorado, a group of 25 people from Yakima hugged, high-fived, and celebrated when Yakima was announced as one of the communities receiving a 2015 All-America City Award. campaign was mounted, Yakima became a finalist, and did win its first All-America City Award. and answer period during which the jury asks presenters about their projects. Perfect Attendance Creates Excellence program, and the 100 Jobs for 100 Kids project. All-America City Award in hand. community’s ability to take on its toughest issues and work together to solve them,” said Mann. 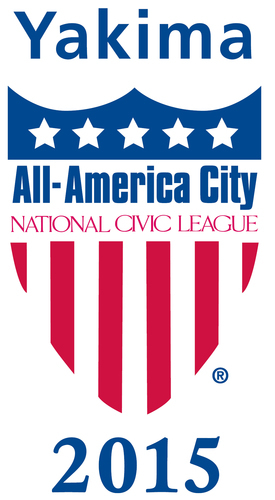 click on the following link - http://www.nationalcivicleague.org/allamericacityaward/.